This summary contains a discussion of the main findings in relation to the general aim of the thesis “Non-Image-Forming Effects of Light: Implications for the Design of Living and Working Environments”and the research questions connecting to the four themes. The work in this thesis has contributed to the research field by adding information on characteristics of the daily light exposure in real-life settings together with seasonal variations regarding psychological and physiological aspects. Moreover, the results of the research that have been carried out have further informed about relationships between different methods of investigating and evaluating lighting conditions in real environments. In this work, diaries, ambulatory instruments and instruments for static field measurements were used to record typical lighting conditions to which office working people in Sweden normally are exposed in their real working and living environments throughout the year. Taken together the results showed daily and seasonal variation concerning various aspects of the daily light exposure. In line with previous findings from field research, the results showed that nowadays are people, living on this high latitude, exposed to substantially less visible light radiation during the winter in comparison to the summer, spring and autumn both when measured as total illuminance exposure and as daily exposure to visible light radiation in the wavelength range between 450 – 500 nm (Cole et al., 1995; Hebért et al., 1998; Park et al., 2007; Thorne et al., 2009; Figueiro and Rea, 2010). Similar to the majority of other studies, office-working people in Sweden spend most of their time in indoor environments during all seasons. When comparing with results from studies carried out on the north hemisphere they seem to be exposed to less light in the winter, relying on artificial lighting to an even greater extent (Oren et al., 1994; Hebért et al., 1998; Guillemette et al., 1998; Aan Het Rot et., 2008) They spend significantly less time outdoors in bright daylight, on average only 10 minutes, during the winter probably both as a consequence of climatic conditions such as temperature and the photoperiod that together with the work schedule lead to commutes to and from work before and after sunrise and sunset respectively. 44 Seasonal differences in light exposure were observed during all time periods of the day except during the night. Largest differences between the seasons were displayed during the afternoon and evening, confirming earlier results. Comparisons of relative light exposure showed that many office workers, especially during the winter but also during spring and autumn, receive most or in any case a substantial part of the daily light exposure at their workplace high-lighting the significance of the lighting conditions in the working environment. 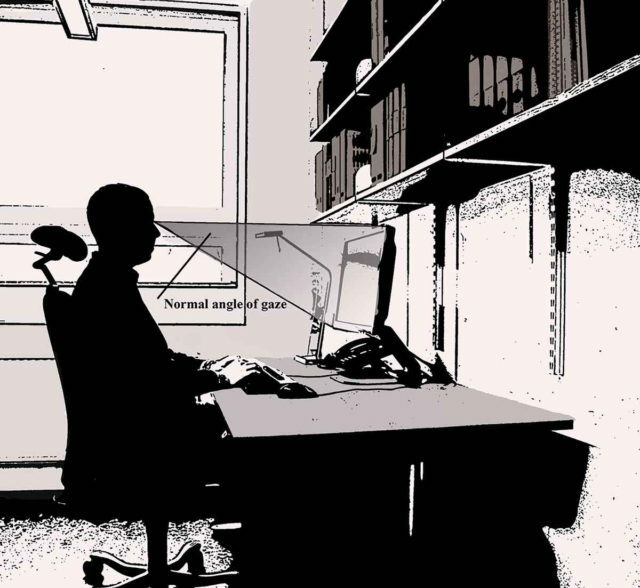 The results from the ambulatory measurements and the static field measurement of illuminance and irradiance showed intensities typically found in office settings, within illuminance ranges suggested that should be maintained according to recommendations (Swedish Standards Institute, 2011). Different types of offices were included in the studies. Most subjects were seated relatively close to a window permitting exposure to daylight through the window. The measures of spectral composition showed that the light in the offices were mainly comprised of short- and middle-wavelength light and suggested seasonal differences with a larger relative contribution of longer wavelength light in the winter. Previous findings reported by Thorne et al. (2009) similarly demonstrated a relatively larger contribution of short-wavelength light in the summer. The two hormones melatonin and cortisol were used as biological markers to investigate possible seasonal variations in physiological processes relating to the daily light-dark exposure and its effect on the endogenous circadian clock. A delyed circadian rhythm was anticipated to be observed during the winter. Also, as a consequence of less exposure to natural daylight in the evening and thus less exposure to short-wavelength light and more exposure to light from incandescent light sources, which include most of the visible light radiation in the middle- and long wave part of the visible spectrum, a higher peak level of melatonin was expected in the winter. Similar to results from a field study by Küller & Lindsten (1992) and laboratory research showing an increase of cortisol in morning after previous exposure to higher intensities of light (Scheer & Buijs, 2009; Leproult et al., 2009), a seasonal change in cortisol was expected with increasing morning levels in the spring. The results from the analysis of the data revealed higher peak values of the expressed melatonin rhythm in the winter. However, no seasonal variation was observed regarding the phase position of the rhythm. These findings, which partly confirm the hypotheses, are in line with results reported from earlier field studies but contrasts from other findings showing an advanced phase position in the summer 45 because of a larger exposure to visible light in the phase-advancing part of the PRC for a day-active person (Ilnerova et al., 1985; Laakso et al., 1994; Morera & Abreu, 2006; Higushi et al., 2007; Crowley et al., 2015). In this study, the analysis of the relative light exposure showed that in the summer, the office workers were exposed to a relatively large proportion of the daily light exposure, especially concerning bright daylight, during the phase delaying part of the PRC (Minors et al., 1991; Kripke et al., 2007; Rüger et al., 2013). However, laboratory work and research carried out in the field have demonstrated the effects of the circadian system’s adaption to previous light exposures and the importance of recognizing relative light exposure patterns rather than absolute levels (Dumont et al., 2001; Hebért et al al., 2002, Chang et al., 2011; 2013; Kozaki et al., 2015). The higher intensities to which the subjects were exposed during the daytime in the summer may have compensated for the increased exposure during the evening when light pulses have a phase delaying effect on the clock. Moreover, although the total daily light exposure was nearly fifteen times lower in the winter, the light exposure pattern, displaying a large proportion of the daily light exposure between 04.00 and 16.00, may explain why no seasonal variations in the timing of melatonin peak levels were observed. Previous reports of an increase in morning cortisol concentrations during the spring were not corroborated in this field study (Küller & Lindsten, 1992). In accordance with most findings, the results from the present research showed that a majority of the subjects experienced a seasonal variation concerning mood (Kasper et al., 1989b; Küller et al., 2006; Park et al., 2007; Grimaldi et al., 2008). When comparing the seasons, higher ratings were reported during the summer and autumn. Also, higher ratings of positive affect were found in the evening during the summer. However, unlike previous results showing associations between light exposure and various psychological measures, including mood, alertness, feelings of vitality, social interaction, and quality of life, no relationship was found between positive affect and exposure to bright levels of daylight outdoors (Espiritu et al., 1994; Aan het Rot et al., 2008; Grandner et al., 2006; Smolders et al., 2013). Previous findings from research investigating seasonal variation in different aspects of sleep have shown contradictive results probably due to methodological differences (Park et al., 2007; Figueiro & Rea, 2010; Friborg et al., 2012; Garde et al., 2014). The self-report diaries used in this study revealed seasonal variations in the sleep-activity pattern as a consequence of seasonal differences in bedtimes 46 although the time of wake-up did not differ. Therefore, the results indicated that the subjects experienced longer sleep durations during the winter in comparison to spring, summer and autumn. Furthermore, the bedtimes were associated with amount of evening exposure to bright daylight outdoors and to the length of the photoperiod. The perception of lighting conditions has been found to have a significant influence on psychological well-being (Küller et al., 2006). In the present study, seasonal variations were observed concerning the quality of the light in addition to how varied the light in the room was perceived. Based on previous findings, the light in the offices was expected to be experienced as stronger and more pleasant during the summer in comparison to the other seasons. This hypothesis was not confirmed by the results. The contradictions may be explained by window placements in the offices which possibly influenced the use of blinds and the balance between daylight and artificial light. Perceived contrast between the brightness of the surfaces outside and the room surfaces may also be influenced by effects of adaption as previously have been found regarding non-image-forming responses of the circadian system (Owen & Arendt, 1992; Morita et al., 2002; Higushi et al., 2007; Rufiange et al., 2007). Regarding associations between positive affect and perception of certain characteristics of the office lighting, a number of correlations were found during some of seasons. In the present research, static- and ambulatory measurements of illuminance and irradiance were compared to investigate the relationship between methods that can be used in research and in practice of lighting design to evaluate lighting conditions with respect to non-image-forming effects of the exposing visible radiation. Overall, the results showed weak associations between the static measurements and the light exposure continuously recorded by the means of portable instruments indicating limitations of using static measurements as an estimate of personal light exposure during daily life. However, there are several important differences between the two methods that were used, including resolution of the collected data, 47 influence of weather conditions and subsequent manual control of shading devices and artificial lighting and natural changes of body position. The field studies in this thesis were conducted in real-life settings. This ecological research approach means that it is difficult to isolate and control external factors that may influence the parameters under investigation and thus affect the validity of the outcomes. The ambulatory measurements of daily and seasonal light exposure and measurements of daily and seasonal concentrations of the two biological markers that were used included a relatively small sample size which has an effect the reliability of the measurements. The longitudinal-, within-subjects, design of the investigation, with a relatively high resolution of the recorded data was selected in an effort to increase the validity of the results. Also, effect sizes were determined to assess the influence of the independent measures on the various dependent variables. A sample including men and women in a wide range of ages was selected leading to both advantages and disadvantages. In the same time as it offers an opportunity to generalize the results, it makes it more difficult to relate the outcomes to different age groups due to few individuals representing each group. Seasonal variations in sleep- and wake-activity were investigated by the use of self-report diaries. Ambulatory measurements offering higher resolution of the sleep and activity data possibly would have increased the reliability. The studies included measurements during regular workdays and can therefore not be inferred to diurnal light exposure during free weekend days. Saliva sampling for measurement of endocrine markers were conducted in the subjects’ natural settings which influence the lighting conditions at the times of saliva collection. Moreover, the measurements are influenced by behavioral stimuli. Consequently, the measurements display the expressed rhythm of melatonin and daily and nocturnal concentrations of melatonin and cortisol. Regarding the instruments used for ambulatory measurements, there are some limitations concerning spectral and spatial sensitivities. As a result of extensive laboratory research, today we have relatively much knowledge about the basic concepts. However, more field studies and data from 48 real-life settings are necessary to further validate the applicability of the current theoretical models in natural settings. As discussed by Lucas et al. (2014), it is important to measure light exposure with a high resolution. This permits calculation of effects on different photoreceptor systems and offer larger possibilities to compare data from different studies and perform meta-analyses. The influence of the different receptors to the resulting signal from the ipRGCs to the SCN depends on the context. Findings suggest that rods and cones contribute to phase shifts of daily rhythm of the master clock at lower intensities and at the beginning of the light exposure and the melanopsin-containing retinal ganglion cells register light radiation at higher intensities and are responsible for the sustained response (Gooley et al., 2010; 2012). The current knowledge about non-image-forming effects show the importance for lighting designers to take non-image-forming effects of light into consideration when choosing lighting solutions, especially in the working environments where people living at high latitudes receive much of their daily light exposure during the winter but also during parts of spring and autumn. It is also important to develop an appropriate lighting technology to be used in the home environments. Furthermore, lighting controls have an important role to support the need of daily variation concerning light intensity and spectral composition. Concurrently with the development of knowledge in the field codes and standards recommendations needs to include this knowledge.